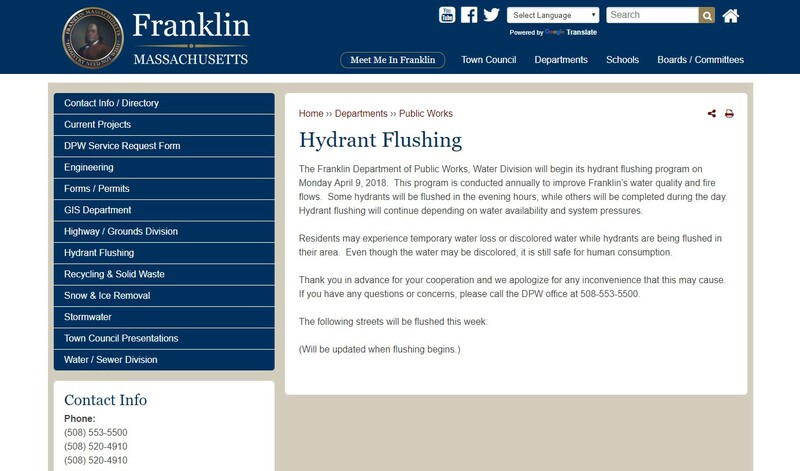 The Franklin Department of Public Works, Water Division will begin its hydrant flushing program on Monday April 9, 2018. This program is conducted annually to improve Franklin's water quality and fire flows. Some hydrants will be flushed in the evening hours, while others will be completed during the day. Hydrant flushing will continue depending on water availability and system pressures. 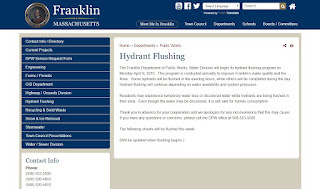 Visit http://www.franklinma.gov/public-works/pages/hydrant-flushing to find out which streets we are working on today. Thank you in advance for your cooperation and we apologize for any inconvenience that this may cause. If you have any questions or concerns, please call the DPW office at 508-553-5500.